You can make your contribution to counter global warming and clearly minimize the release of CO2 with the Binopterus®, while at the same time making yourself independent of continually rising power prices. Become part of a community and make your personal contribution to maintaining an Earth worth living on! The Binopterus® - a high-tech wind turbine, entices with its shape, design and function. Its innovative build permits power generation even at low wind speeds. At a wind speed of just 3 m/s (with Wind Collector) or 4 m/s (without Wind Collector), a charging current for a 12 Volt or 24 Volt battery can be generated already, which in turn can be used to feed the building grid via an inverter. For regions with particularly low wind, the Binopterus can be equipped with the Wind Collector, which is aligned in the main wind direction. 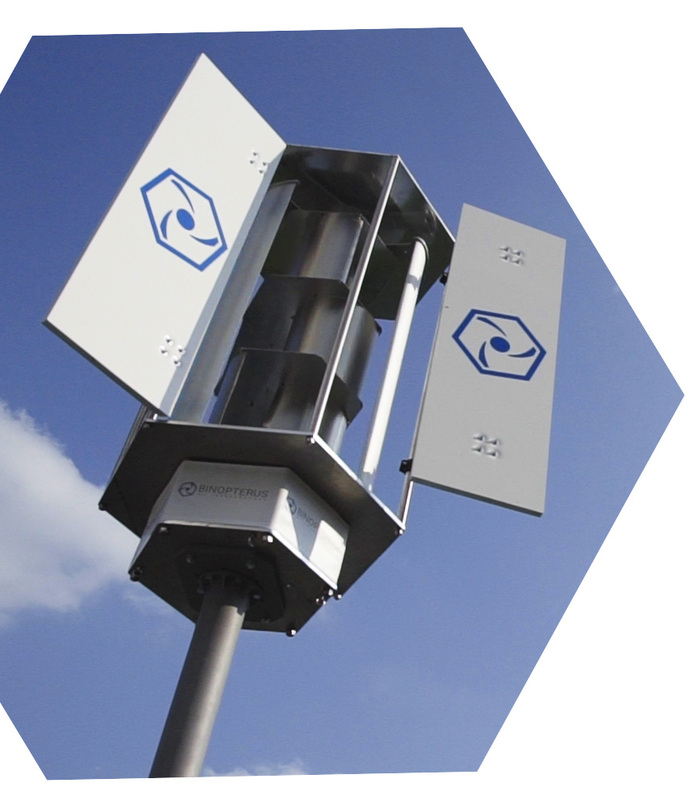 The funnel-shaped device collects additional wind streaming past and permits charge currents at as little as 3m/s. The blades additionally serve as ideal advertising surfaces for your company. A moving object will always draw more attention than a stationary one. We will gladly deliver the blades already printed with your advertisements. Just send your request to info@binopterus.com. The Binopterus® combines two wind turbine shapes in one: the resistance rotor and the lift rotor. The vertical shape makes the wind turbine independent of the wind direction. The Binopterus® supplies a continuous charge current for a 12 or 24 Volt battery even at a low wind speed of 3-4 m/s. The power can be fed into the building grid with a conventional inverter. The subject of climate protection has been playing an ever larger role in all areas of our daily lives for quite some time. Global warming as a consequence of wasteful and thoughtless use of our planet's fossil resources must be stopped as quickly as possible according to experts and politicians ("We cannot continue as we have been doing. Climate protection is the greatest challenge of the 21st century."1). There are different ways to reduce the greenhouse effect. The most important aspect is that power production must change from using coal or gas to climate-neutral renewable energies produced, e.g., in photovoltaic systems, by biogas or wind turbines. We, the "Binopterus Team", want to contribute to countering this threatening development of climate change. A single Binopterus can never be enough, but the mass, as a collective, can achieve an enormous effect. For example, if every town, municipality or village in Germany puts up only one Binopterus, 29 M liters of oil or 76 M tons of CO2 can be saved within approx. 20 years. The incredible fact that 1.2 billion people in the world are living without electricity has additionally confirmed our decision to develop and implement the Binopterus. Every Binopterus offers an additional bit of independence from continually rising power prices and the lobby of the power groups. The power prices climbed by 3.4 % per year(!) on average in the last 10 years. An end to this development is not in sight. Every individual can counter this with a Binopterus. The Binopterus combines two wind turbine types in one: the resistance rotor at the center and the lift rotor overtaking the resistance rotor on the outside. The Binopterus is made entirely of aluminum and stainless steel to ensure a long service life without power loss. The Binopterus is suitable for low- and strong-wind regions alike. With its low start-up speed and high torque, it is able to charge a 12 Volt or 24 Volt battery even at wind speeds of only 3-4 m/s. The charge current from the battery can also be used as an island solution. The Binopterus is an innovative, globally unique high-tech wind turbine. Support green energy and be part of a community against climate change! How many people are needed to assemble the Binopterus? In Germany, small turbines with a height of 10 meters from the ground or roof edge generally do not require permits. Nevertheless, setup in conurbations should still be coordinated with the building office and the neighbors. How long will the warranty run? The warranty covers one year. This does not include damage from "force majeure". How are spare parts supplied? If a part is defective, it will be sent to you free of charge during the warranty period. After the warranty period, the spare part will be sent to you against payment of the part price and the shipping costs. How high is the maintenance effort? The wind turbine is generally maintenance-free; the bearings can be relubricated and there are virtually no wear parts. Who is behind the Binopterus? Martin is a trained engineering master. He runs his own little engineering company near Heidelberg, where the Binopterus is produced at the highest precision and quality with the predicate "Made in Germany". Martin has already successfully registered several innovative patents in the area of clamping technology and furniture construction in the past. His furniture can be purchased online at www.callarasso.de. His entire work and philosophy in life is subject to the motto of product "quality" for the customer. Martin is 53 years old and has 35 years of professional experience in the areas of metal and wood construction. Stefan is 45 years old and a trained forwarding merchant. He is the multi-talented logistics and organization expert and supports the project with full conviction to fight climate change. We are very delighted that you have shown interest in our enterprise. Data protection is of a particularly high priority for the management of the Autocom Rental&Trading Gmbh. The use of the Internet pages of the Autocom Rental&Trading Gmbh is possible without any indication of personal data; however, if a data subject wants to use special enterprise services via our website, processing of personal data could become necessary. If the processing of personal data is necessary and there is no statutory basis for such processing, we generally obtain consent from the data subject. The processing of personal data, such as the name, address, e-mail address, or telephone number of a data subject shall always be in line with the General Data Protection Regulation (GDPR), and in accordance with the country-specific data protection regulations applicable to the Autocom Rental&Trading Gmbh. By means of this data protection declaration, our enterprise would like to inform the general public of the nature, scope, and purpose of the personal data we collect, use and process. Furthermore, data subjects are informed, by means of this data protection declaration, of the rights to which they are entitled. As the controller, the Autocom Rental&Trading Gmbh has implemented numerous technical and organizational measures to ensure the most complete protection of personal data processed through this website. However, Internet-based data transmissions may in principle have security gaps, so absolute protection may not be guaranteed. For this reason, every data subject is free to transfer personal data to us via alternative means, e.g. by telephone. The data protection declaration of the Autocom Rental&Trading Gmbh is based on the terms used by the European legislator for the adoption of the General Data Protection Regulation (GDPR). Our data protection declaration should be legible and understandable for the general public, as well as our customers and business partners. To ensure this, we would like to first explain the terminology used. The website of the Autocom Rental&Trading Gmbh collects a series of general data and information when a data subject or automated system calls up the website. This general data and information are stored in the server log files. Collected may be (1) the browser types and versions used, (2) the operating system used by the accessing system, (3) the website from which an accessing system reaches our website (so-called referrers), (4) the sub-websites, (5) the date and time of access to the Internet site, (6) an Internet protocol address (IP address), (7) the Internet service provider of the accessing system, and (8) any other similar data and information that may be used in the event of attacks on our information technology systems. When using these general data and information, the Autocom Rental&Trading Gmbh does not draw any conclusions about the data subject. Rather, this information is needed to (1) deliver the content of our website correctly, (2) optimize the content of our website as well as its advertisement, (3) ensure the long-term viability of our information technology systems and website technology, and (4) provide law enforcement authorities with the information necessary for criminal prosecution in case of a cyber-attack. Therefore, the Autocom Rental&Trading Gmbh analyzes anonymously collected data and information statistically, with the aim of increasing the data protection and data security of our enterprise, and to ensure an optimal level of protection for the personal data we process. The anonymous data of the server log files are stored separately from all personal data provided by a data subject. On the website of the Autocom Rental&Trading Gmbh, users are given the opportunity to subscribe to our enterprise's newsletter. The input mask used for this purpose determines what personal data are transmitted, as well as when the newsletter is ordered from the controller. The Autocom Rental&Trading Gmbh informs its customers and business partners regularly by means of a newsletter about enterprise offers. The enterprise's newsletter may only be received by the data subject if (1) the data subject has a valid e-mail address and (2) the data subject registers for the newsletter shipping. A confirmation e-mail will be sent to the e-mail address registered by a data subject for the first time for newsletter shipping, for legal reasons, in the double opt-in procedure. This confirmation e-mail is used to prove whether the owner of the e-mail address as the data subject is authorized to receive the newsletter. The newsletter of the Autocom Rental&Trading Gmbh contains so-called tracking pixels. A tracking pixel is a miniature graphic embedded in such e-mails, which are sent in HTML format to enable log file recording and analysis. This allows a statistical analysis of the success or failure of online marketing campaigns. Based on the embedded tracking pixel, the Autocom Rental&Trading Gmbh may see if and when an e-mail was opened by a data subject, and which links in the e-mail were called up by data subjects. Such personal data collected in the tracking pixels contained in the newsletters are stored and analyzed by the controller in order to optimize the shipping of the newsletter, as well as to adapt the content of future newsletters even better to the interests of the data subject. These personal data will not be passed on to third parties. Data subjects are at any time entitled to revoke the respective separate declaration of consent issued by means of the double-opt-in procedure. After a revocation, these personal data will be deleted by the controller. The Autocom Rental&Trading Gmbh automatically regards a withdrawal from the receipt of the newsletter as a revocation. The website of the Autocom Rental&Trading Gmbh contains information that enables a quick electronic contact to our enterprise, as well as direct communication with us, which also includes a general address of the so-called electronic mail (e-mail address). If a data subject contacts the controller by e-mail or via a contact form, the personal data transmitted by the data subject are automatically stored. Such personal data transmitted on a voluntary basis by a data subject to the data controller are stored for the purpose of processing or contacting the data subject. There is no transfer of this personal data to third parties. If one of the aforementioned reasons applies, and a data subject wishes to request the erasure of personal data stored by the Autocom Rental&Trading Gmbh, he or she may, at any time, contact any employee of the controller. An employee of Autocom Rental&Trading Gmbh shall promptly ensure that the erasure request is complied with immediately. Where the controller has made personal data public and is obliged pursuant to Article 17(1) to erase the personal data, the controller, taking account of available technology and the cost of implementation, shall take reasonable steps, including technical measures, to inform other controllers processing the personal data that the data subject has requested erasure by such controllers of any links to, or copy or replication of, those personal data, as far as processing is not required. An employees of the Autocom Rental&Trading Gmbh will arrange the necessary measures in individual cases. If one of the aforementioned conditions is met, and a data subject wishes to request the restriction of the processing of personal data stored by the Autocom Rental&Trading Gmbh, he or she may at any time contact any employee of the controller. The employee of the Autocom Rental&Trading Gmbh will arrange the restriction of the processing. In order to assert the right to data portability, the data subject may at any time contact any employee of the Autocom Rental&Trading Gmbh. The Autocom Rental&Trading Gmbh shall no longer process the personal data in the event of the objection, unless we can demonstrate compelling legitimate grounds for the processing which override the interests, rights and freedoms of the data subject, or for the establishment, exercise or defence of legal claims. If the Autocom Rental&Trading Gmbh processes personal data for direct marketing purposes, the data subject shall have the right to object at any time to processing of personal data concerning him or her for such marketing. This applies to profiling to the extent that it is related to such direct marketing. If the data subject objects to the Autocom Rental&Trading Gmbh to the processing for direct marketing purposes, the Autocom Rental&Trading Gmbh will no longer process the personal data for these purposes. In addition, the data subject has the right, on grounds relating to his or her particular situation, to object to processing of personal data concerning him or her by the Autocom Rental&Trading Gmbh for scientific or historical research purposes, or for statistical purposes pursuant to Article 89(1) of the GDPR, unless the processing is necessary for the performance of a task carried out for reasons of public interest. In order to exercise the right to object, the data subject may contact any employee of the Autocom Rental&Trading Gmbh. In addition, the data subject is free in the context of the use of information society services, and notwithstanding Directive 2002/58/EC, to use his or her right to object by automated means using technical specifications. If the decision (1) is necessary for entering into, or the performance of, a contract between the data subject and a data controller, or (2) it is based on the data subject's explicit consent, the Autocom Rental&Trading Gmbh shall implement suitable measures to safeguard the data subject's rights and freedoms and legitimate interests, at least the right to obtain human intervention on the part of the controller, to express his or her point of view and contest the decision. If the data subject wishes to exercise the rights concerning automated individual decision-making, he or she may, at any time, contact any employee of the Autocom Rental&Trading Gmbh. If the data subject wishes to exercise the right to withdraw the consent, he or she may, at any time, contact any employee of the Autocom Rental&Trading Gmbh. 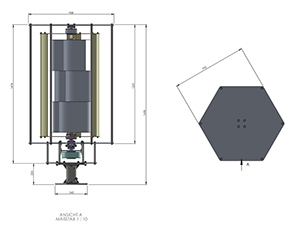 © 2019 Binopterus – The revolutionary Wind Turbine.